Tokoriki Island Resort, Fiji, was just ranked #1 by travellers of the world’s largest travel site TripAdvisor as THE BEST OF THE MAMANUCA ISLANDS, TOP TEN HOTELS IN FIJI, HOTELS FOR ROMANCE IN FIJI and #1 BEST RESTAURANT IN THE MAMANUCAS for “Oishii’ Teppanyaki. Tokoriki Island Resorts offers one of the most romantic couples and honeymoon experiences in the South Pacific along with exquisite Fijian warmth and hospitality. 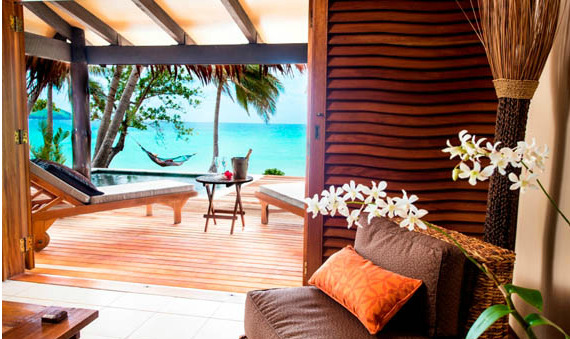 A child-free, boutique retreat located in the Mamanuca Islands Fiji exudes all things indulgent. The 34 beachfront, air-conditioned bures and villas are freestanding with a fusion of contemporary style and Fijian design, enveloped in lush tropical gardens, featuring both indoor/outdoor showers and personal pools. Tokoriki’s General Manager, Robert Ring comments, “It has, and always will be our priority to provide the highest level of service and care to our guests. Today’s acknowledgments from TripAdvisor is a true testament once again from our wonderful guests who have shared their amazing Tokoriki experience with the world! We are very proud of our beautiful resort and on behalf of our incredible Fijian Team we wish to thank our guests immensely for their outstanding reviews. Vinaka vakalevu”. Email us today for more information on Tokoriki and to book your trip to Fiji!